The past couple weeks I've had the good fortune of driving by this local church, to and from work. Yesterday I finished up the job so on the way home I finally stopped to take a few pictures. I swear, next year I'm growing Zinnia's in my garden! I like the Bumble. He stopped by for just a second but I caught him! I'll be linking up with Mary's Little Red House a little later on today for Mosaic Monday! You are fortunate that you can drive by such beauty! Thanks for sharing it so that I can enjoy it through your amazing photos! We used to be pastor and wife at a tiny church up on the hill in Montgomery, MA - years and years ago! Another picturesque place - full of great memories for us! AWESOME photos!! I passed by a little church earlier this week too but was in a hurry so couldn't stop, but it was nowhere near as lovely as the church in your photos! Absolutely splendid shots of the church... you never disappoint! Thanks for sharing! Spectacular shots, Sharon! I want to go to that church someday! Zinnias are one of my favorite flowers. I love to pick them and put them in a pretty tall vase. How nice that you were able to take these pictures on such a glorious day, and with colorful blooms accentuating it. Wonderful pics! Beautiful church, and you did a great job photographing. That is a beautiful church! and such pretty zinnia's, love them! Lovely church and zinnias. Zinnias remind me of my Granny ... colorful, old fashioned and tough!!!! Beautiful images and so nice you can see them everyday. Great photos ... I just love that white Church set against such a gorgeous blue sky! It's a beautiful building. Love the colour of the Zinnias as well. 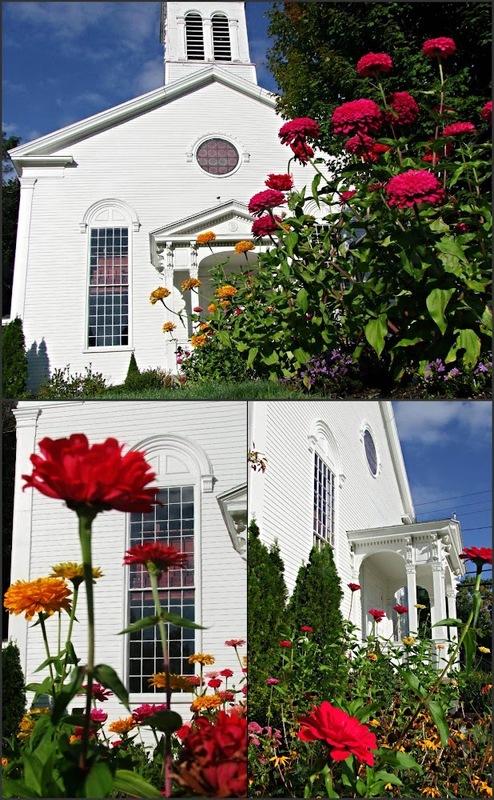 Beautiful church and the Zinnias are lovely. They make a gorgeous mosiac. What a lovely and beautiful piece of history. Your mosaic of the zinnias is just spectacular...oh, and love the bumble bee! Great looking church. I love the angles of the photos. 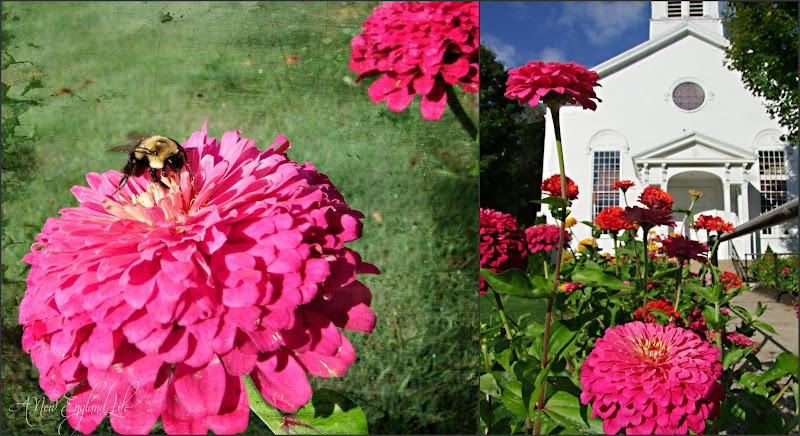 I LOVE how you took these shots through the perspective of the zinnias...perfect! I just loved them. How very Gorgeous. Im just starting with this MM . what beautiful images. Lovely white church and landscape, just lovely! 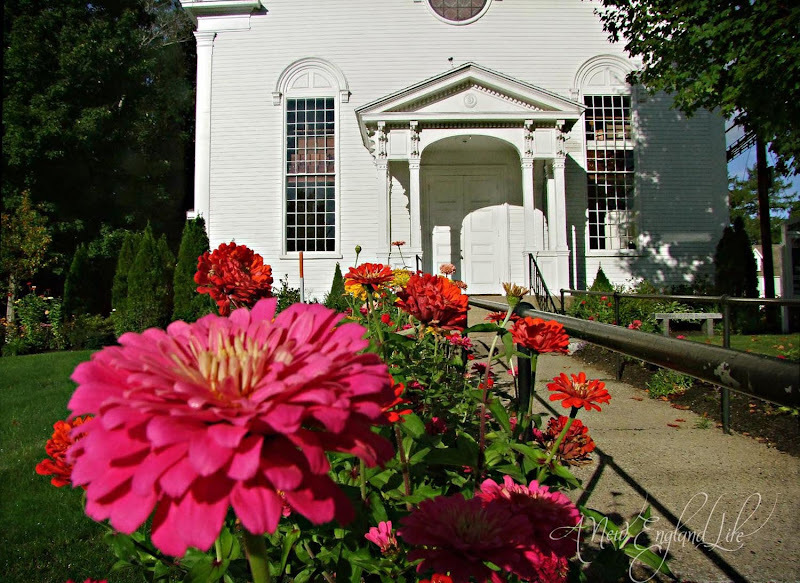 I adore these iconic images of New England and I also appreciate churches where someone takes an interest in the church's landscaping. It speaks volumes. You've got an eye for a good photo, my friend. Love the white against the blue with the exciting splashes of late summer color!! I agree-- those zinnias are so pretty and I think I'd love to grow some in my garden next summer. Wonderful church. Happy MM! The church and the zenias are stunning...but my fav is the bumble bee stopping to do its business. Gorgeous pics - the church, the flowers...BEAUTIFUL!! And what a beautiful day it must have been - the sky is glorious! 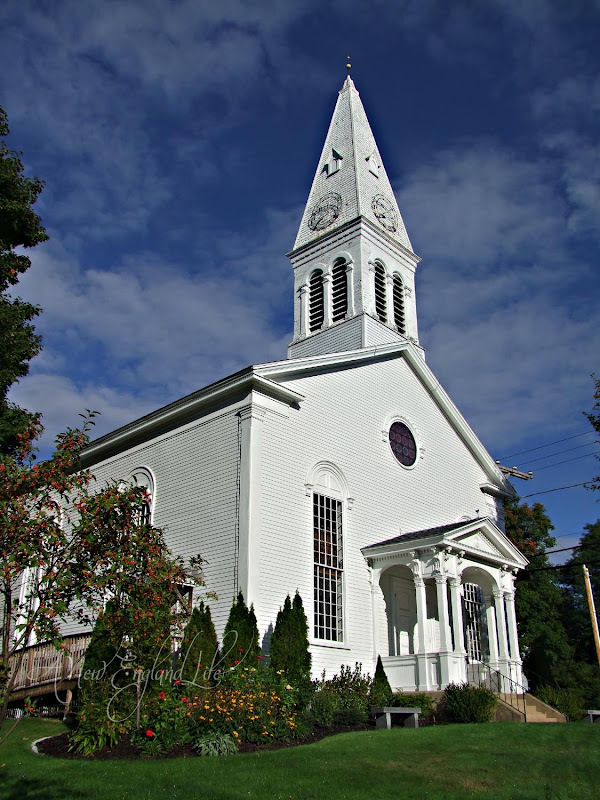 I think that anyone who has ever been to New England would recognize a church such as this. What a beautiful structure, against the blue sky. Like you, I'm going to grow zinnias next year too. What was I thinking, leaving them out this year? So beautiful Sharon! My mom and dad always have a fence line full of zinnias and they are always so cheerful. Wow those photos are gorgeous. Looks like the perfect day with the deep blue sky and the very white of the church. What a lovely church! Gorgeous flowers too!! Very nice pics, this church has a presence! A very lovely church! And very fines mosaics too. so I now am a follower!! you are really getting me excited..25 days and I will be seeing white churches, fabulous leaves and colours, can't wait. How beautiful! I half expected a bride and groom to step out of the front door! The grounds of the church are stunning! Thanks for sharing with us. Just today at lunch, a co-worker and I walked by a local business with a bunch of colorful zinnias out front. I too confirmed to myself (and my co-worker) that it is my intention to grow them in my garden next year. Gorgeous photos - amazing church! 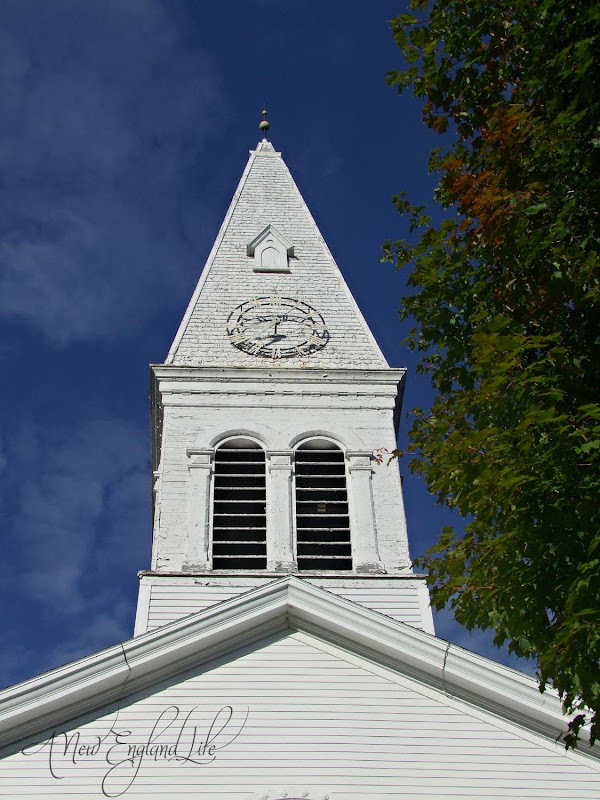 I love that white steeple against that gorgeous blue sky! And those pink zinnias are stunning!